The Merry Widow’s styling is definitely pre-Prohibition—long on vermouth, and with dashes of absinthe and liqueur. It seems to have been around at least since Hugo Ensslin published it in his 1916 Recipes for Mixed Drinks . It seems likely that the drink’s name is a response to the very successful operetta of the same name, which appeared in 1905, and continued to be popular for many years. Stir well in a mixing glass with cracked ice, strain and serve with a twist of lemon peel on top. 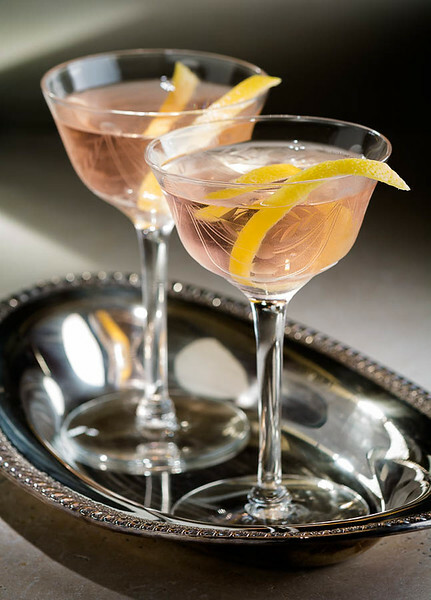 The Merry Widow is designed for classic London Dry gins. Tanqueray suits my taste, but Beefeater or Bombay would work well, too. 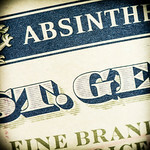 Some absinthes are lighter than others, but the two dashes called for in the original formula makes a fine starting point. The absinthe gives the drink a bit of a nose, melds well with the herbality of the Bénédictine, and as any Sazerac drinker will tell you, is a natural with the spices of Peychaud’s bitters. You want to use just enough that it makes its presence known. A well-made Merry Widow will give you an initial scent of expressed citrus oils and a faint, earthy herbality. The first taste is the cold gin and vermouth, a little sweetness, then an increasing presence of herbs from all directions. The swallow is recognizably Bénédictine, and finally there is the long anise and wormwood note of the absinthe. I can’t decide which is the more interesting diversion from the standard Martini—the herbal earthiness, or that long-tailed aftertaste. The Martini is crisp and clean, simple and unambiguous. A quick, cold, crystal clear hit. The Merry Widow starts in the same place—cold gin and vermouth—but tags on a complicated, long-lasting, earthy herbality. It’s more complex, and more difficult. We’ve noted some other Ensslin cocktails in the past, notably the Aviation, the Deshler, and the Affinity. To the list, I’m happy to add the Merry Widow. Here’s to Hugo Ensslin, his insight, and his imagination. “A Martini with Something In It — The Merry Widow Cocktail” at cold-glass.com : All text and photos © 2015 Douglas M. Ford. All rights reserved. Now this sounds like a marvelous cocktail. I love the color and it sounds delightful with a bit more flavor than a standard martini. Other than the fact that I don’t have Benedictine or absinthe around…. I would make this. Definitely one to keep on my list of things to make. Yes, it is a charming, soft pink. Keep it on your list, I don’t think you’ll be sorry. I definitely will. See, I am a firm believer that if you don’t like the way a drink looks, you won’t want to drink it either. But, of course how it tastes is quite important. I’m so glad you posted the recipe and history behind it. It looks like a great cocktail. I wonder how it would work with either Hayman’s Royal Dock Navy Strength gin (possible a little too “hot”) or with genever. I may have to try it with both this weekend. Thanks for posting the recipe. Sounds like a very interesting experiment. I’m guessing the genever is your best bet. Thanks for the idea, I may try that, too. O, Gosh! It sounds like yet another absolutely wonderful “Martini” for my collection. Today evening (e.g. right now) I am looking for some inspiration for translating one of my last post about Atty Cocktail, and looks like I’ve found it 8) Thanks, being a huge fan of a Martini I look forward to testing the Merry Widow! I’ll be watching Science of Drink to learn what you have to say about it! I hope you enjoy it. “A pearl from dusty books,” I like that. And I’m delighted that you took time to leave your thoughts here, thanks!